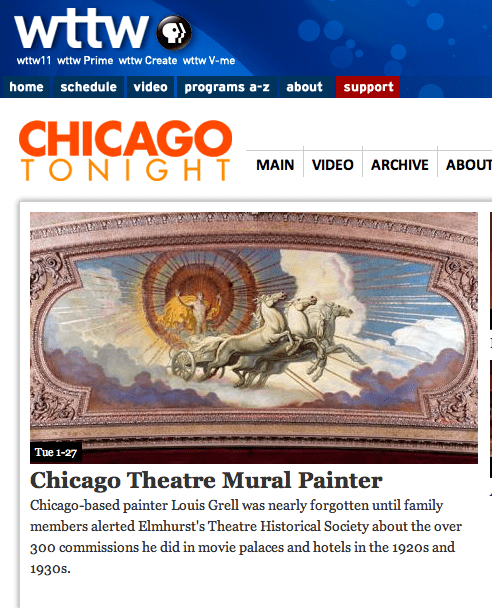 WTTW Chicago, Tuesday @ 8 PM, Chicago Tonight | Louis Grell Foundation - "Showcasing the Legacy of Artist Louis Frederick Grell"
The Chicago PBS affiliate, channel 11, is running a segment on Louis and his mural work inside the Chicago Theatre. It will air Tuesday, January 27th begining at 7 PM during the Chicago Tonight program and will be available Wednesday on their website. Thank You Marc Vitali, WTTW Producer for putting the segment together. Also, we would like to thank Dr. Wendy Greenhouse, Javier Ayala from the Chicago Theatre and Madison Square Garden. Additionally, a special thanks to Richard Fosbrink and the Theatre Historical Society of America for contributions.